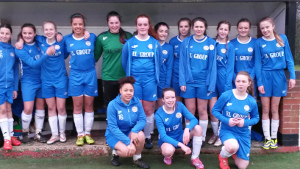 Leicester City Ladies Diamonds were beaten 3-1 in extra time by a determined and competitive Oadby Owls’ side who gave everything for their Manager to win the County Cup. The game was a great advert for girls football and was played at a terrific pace and with some great football and the game ebbed and flowed throughout. On the night no side deserved to win or lose but there has to be a winner and Oadby Owls proved the stronger and better finishers in extra time to gain their win and fair play to them. The first half mainly belonged to the Diamonds but Oadby were always threatening on the break. The Diamonds created numerous half chances with both Lauren and Shania coming close but they couldn’t breach the Owls defence and goalkeeper who had a superb game. Both sides were passing the ball well and the quality shown by both sides was a joy to watch. With half time approaching the Diamonds took the lead when Olivia D superbly drove the ball home to give the Diamonds a 1-0 lead at half time. At half time the Diamonds were warned that Oadby Owls were not finished and so it proved. Again the play was pretty even and the determination and skill shown by both teams was superb and must have been a pleasure to watch for the neutral. With 20 minutes left Oadby Owls’ equalised with a superb effort from their striker and it was game on. Again both sides battled and both had chances to win the game in normal time. The best chance fell to D’shayney a minute from time but her header came back off the bar and the sides were level at full time. This led to 10 minutes extra time each way. There were some tired legs on both teams with players going down with cramp at various intervals. The quality was still in the game but the chances were getting less. That said once again the Oadby Owls’ striker scored a superb strike to give Oadby the lead for the first time. The 1st half of extra time ended with Oadby winning 2-1. In the 2nd half of extra time it didn’t matter what the Diamonds threw at Oadby as it was repelled. With a minute to go their striker completed her hat trick with another superb strike to finally put the game to bed with a 3-1 victory. As much as it was a disappointment for the Diamonds to lose the Final as it was an even affair credit must go to Oadby Owls. Their Management and players fully deserve their success as they play the game in the right way and both sets of players were a credit to their clubs. Hopefully the Diamonds will bounce back and win something this season as that is what their players deserve for such a good season they have had. Leicester City Ladies Diamonds: Jocelyn, Eleni, Shania, Beth, Lucy, Olivia D x 1, Olivia C, Lauren, Tiarna , Molly, Jenna, D’shayney, Laura, Megan and Chloe.